OXFORD, England (CNS) — A Ukrainian Catholic bishop warned his church could lose its legal status in Crimea under Russian rule and pledged to use “all possible means in the international arena” to defend it. “Greek Catholic communities like ours are denied rights in the Russian Federation, which we see as a violation of freedom of conscience and religion,” said Bishop Bohdan Dzyurakh, secretary-general of the Ukrainian Catholic Synod of Bishops. 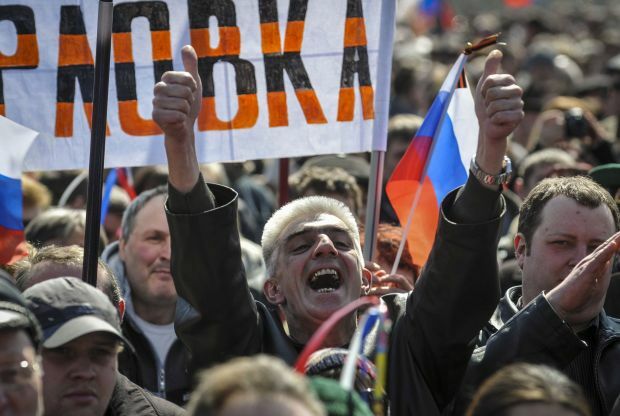 Bishop Dzyurakh spoke to Catholic News Service in early April as pro-Russian protesters stormed Ukrainian government buildings in the eastern cities of Donetsk, Lugansk and Kharkiv, raising fears of a new Russian military intervention after the March annexation of Crimea. He said the situation in Crimea remained “tense and dangerous” for Catholic clergy, after one priest was arrested and threatened with prison, and others were branded “Vatican agents” and warned to leave. “Catholics are still leaving Crimea — hardly anyone remains in some communities, and it’s hard to see how our pastoral work can survive,” he told CNS. “We’re consulting legal experts about our rights under international law, since these are issues of fundamental religious freedom too important to be left in the hands of local officials,” he said. The bishop said two Redemptorist priests were currently running the church in Crimea, and plans had been made to replace clergy with families with unmarried pastors from religious orders. In Crimea, “the threats and accusations against us recall Soviet propaganda from when our church was suppressed in 1945-46, and we’ve no illusions as to what this portends,” Bishop Dzyurakh said. The Ukrainian Catholic Church, a Byzantine rite, was outlawed under Soviet rule from 1946 to 1989, when many clergy were imprisoned and most church properties seized by the state or transferred to Russian Orthodox possession. Ukraine’s acting Prime Minister Arseniy Yatsenyuk said April 3 that his government also was concerned about religious freedom violations among the 2 million Ukrainians living in Russia. However, he added that churches and properties belonging to Ukraine’s independent Orthodox Church of the Kiev Patriarchate had already been seized by Russian Orthodox groups in Crimea, while pressure also was being exerted on parishes belonging to the peninsula’s Latin-rite Catholic vicariate. Ukrainian newspapers said Russian pressure on Ukraine was likely to exacerbate Catholic-Orthodox ties, as leaders of both churches found themselves on opposing sides. Ukraine’s Council of Churches and Religious Organizations, whose 18 member-denominations includes Catholics and Orthodox, condemned the “artificial provocation and incitement of religious hatred and intolerance” in an April 4 statement. The Ukrainian government said April 3 it had been forced to cancel beneficial energy rates for religious communities after Russia doubled the price of gas supplies. Bishop Dzyurakh said his church had been heartened by expressions of support from Pope Francis and Catholic bishops’ conferences worldwide. “Ukraine has given the world an example of self-organization and self-sacrifice in defending human rights and fundamental values,” the bishop said. “A free democratic Ukraine will be a good partner for both its Western and its Eastern neighbors. All churches and religious communities are united with the nation and praying God will save our country,” he said.